It has been some time since they released a movie on this franchise, but you probably remember it from the previous movies. The action/adventure series features treasure seekers taking on mummies around the Egyptian pyramids. Given the success of the film series, it had to be a major game developer who would get a license to turn the franchise into a slot machine. It is not surprising that Playtech got the license and truth be told; they made an incredible slot that is fun and thrilling to play. This is a game for Mummy, slot and game fans generally. The Mummy slot is a five-reel game with 25 pay lines that can be played from any online casino powered by Playtech. The Mummy slot gives players options of wagering up to $5 per line for people who don’t mind spending, though players on a budget can wager less than that. Like any other slot, the objective is to match identical symbols across the active pay lines. The more symbols you match, the bigger the winnings. The symbols in use by Mummy, the slot game, are borrowed from the movie series. In fact, the theme of the slot borrows entirely from the movie series. The imagery in use includes the cast members of the movie that includes photos of The Rock and Brendan Fraser. The movie is set in Egypt, so you expect all manner of Egyptian appurtenance. To add to this collection, you will find tools that will help you take down the evil Mummies (guns for instance). Like many other slots from Playtech, the most valuable symbols in the Mummy slot are the wild and the scatter symbols. The wild symbol is a Mummy and can be substituted for any other symbol to form a winning combination. The only symbol that the wild Mummy cannot replace is the Scatter symbol. The scatter symbol is the movie logo and is ‘notorious’ for earning you multipliers. The reason you will choose the Mummy as your default game of choice is the game’s distinctive features. The game has some of the best special features ever to come out of Playtech; including one unique feature that is found in no other slot game. Mummy Hunt bonus is activated by landing the Mummy symbols on the first and fifth reels. This automatically takes you into an underground passage that lies below the pyramids. There you will find more treasures, but not without battling mummies. You will have the option of two doors; one will lead you straight to an ambush, and the second one will give you a vantage point over the old creatures of death. For every correct choice, you get a prize bonus. If you choose incorrectly, you are finished! And so is the game. The free spin game is activated when you land the free spin symbols on the 1st, 3rd, and 5th reels in the same spin. The game changes the rules of the free spins game we are used to in other slots. 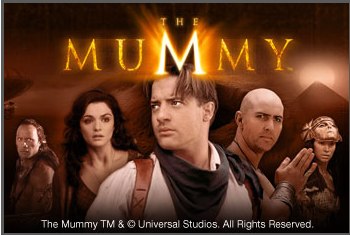 In Mummy, you start with only five free spins. Every time you hit a wild symbol during the free spins, it is totaled up to a stash of wilds you have collected during the spins. At the end of a standard spin, the stashed up wilds will be stationed on the reels at the same time to create a mega spin. A mega spin means mega wins. If you thought the fun is over, let me break it to you; we are just starting. The real deal in The Mummy is the Lost City Adventure Bonus. This is a randomly triggered game that teleports you to a second screen – I bet the first screen can’t handle the massive wins. In the second screen, you will find six boxes. You will be given the opportunity to click on the crates to receive instant prizes. When you hit the “Collect” symbol, part one of the game will end. We can never say enough of the Mummy slot, but in a nutshell, it is a great game to play that has a perfect blend of winnings and fun. Whether you are a huge fan of the franchise or you’ve heard of it for the first time today, you will love this game.